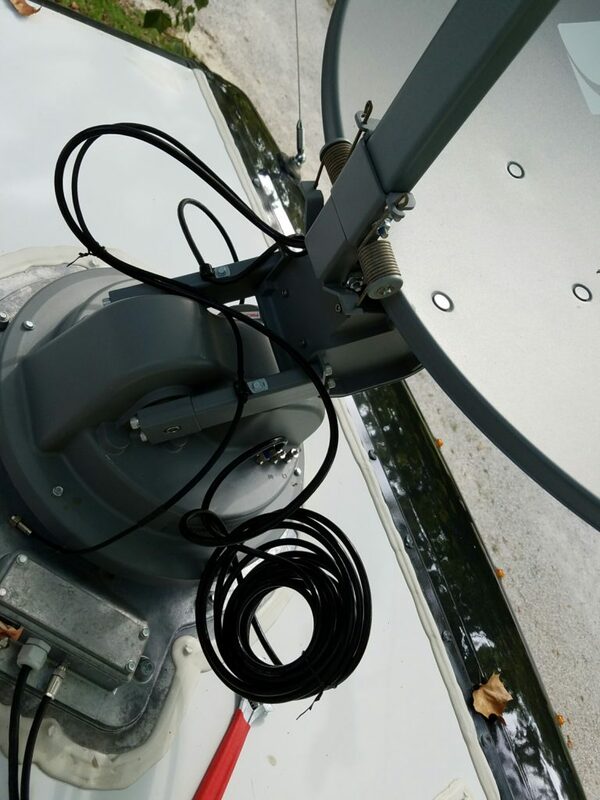 No LNB Voltage – Live MoHo! If you have been reading since the beginning of the blog, you will fondly recall my post on satellite tv options. 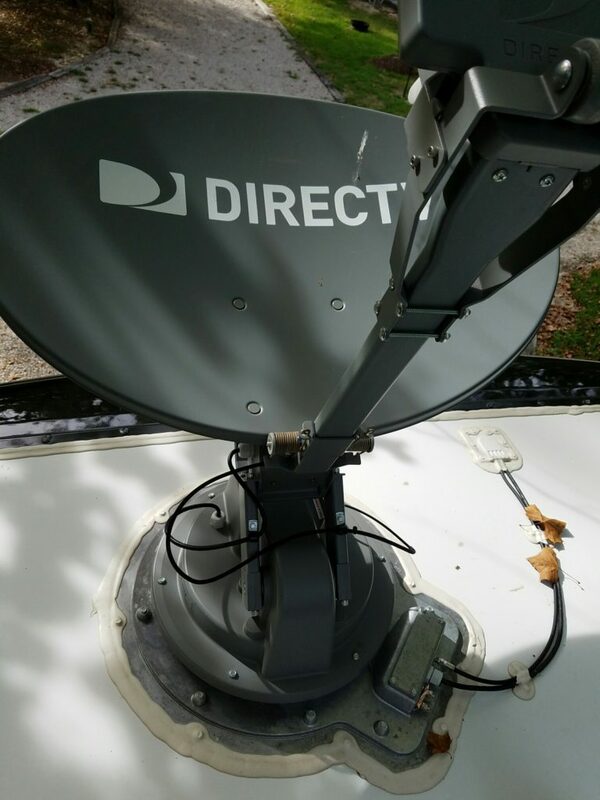 We ended up selecting the Winegard Travel’r SWM model and DirecTV as the network service. It wasn’t an easy choice. There are so many options to choose from and the options are somewhat confusing. On top of that, the price tag is not cheap either. If I recall correctly, around $2500 installed. Since our stay in Florida, I have noticed our dish periodically displaying “no LNB voltage” on its control box. It would happen when I raised the dish when we arrived at a new campground. Each time, I powered the system on and off a few times. You know, the troubleshooting step that fixes 90% of computer-based issues. The other 10% are cabling, btw. Eventually the dish started up. A week ago in Charleston, I saw the error and it wouldn’t go away. I reset the power to the control box and to the power inserter box and checked all the cable connections in the MoHo. Sure enough, a couple were a little bit loose. I powered up the dish again and it went through its search routine normally and locked on! I thought I had solved the issue. Good thing too, because I called Winegard technical support and after being told that they were having unusually heavy call volume, I was asked to leave a message and would get a callback. I left a message and two days later got a callback, but I was in a museum and couldn’t answer. Since the dish seemed to be working, I didn’t try to return the call. When we got to Fayetteville, I powered up the dish and the ‘no LNB voltage” error was back. This time, it was back for good. No amount of resetting or cable tightening on my part did anything. I even got up on the roof and checked the cables to the dish itself. They were all tight. Once again, I called Winegard. Once again, I was told to leave a message due to “unusually high call volume.” The next day a support tech called me back and fortunately I was in a position where I could answer! 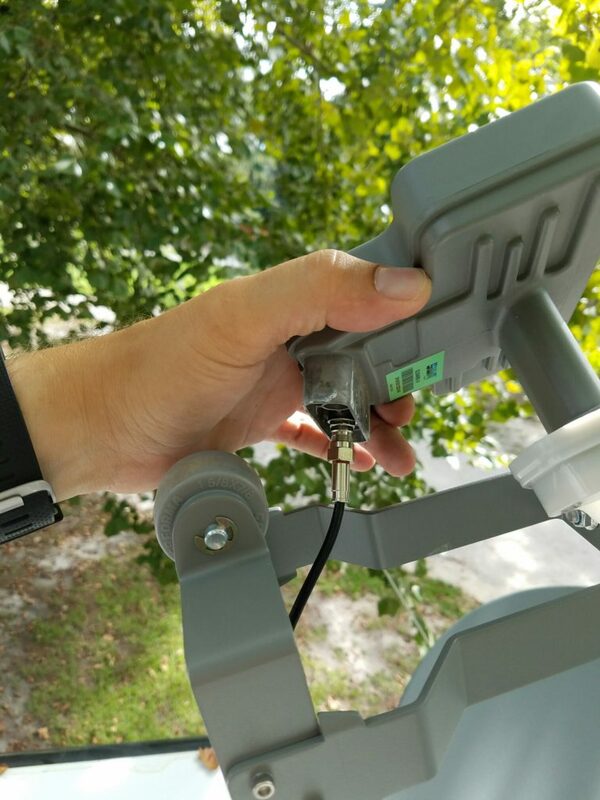 She told me that error usually means the cable between the LNB (the little box at the end of the arm pointed at the middle of the dish) has gone bad. She said I needed to get a 5′ or 6′ piece of regular coax cable and replace the short cable on the roof. If it worked, she said, they would send me a replacement. Uh, I have to fix this myself? I would have to raise the dish and then freeze it in place so I could disassemble the end of the arm. She sent me instructions on how to get the dish to raise up and then make it freeze. Fortunately, it all sounded pretty simple. I raised the dish and then locked it in place. I climbed on the roof with my tools and the new coax cable. Once I got up there, I disassembled the end of the arm so I could get to the back of the LNB. It wasn’t too difficult. In fact, it was very simple. But boy was it HOT up there on the roof! Once I had the LNB removed and the guard loosened, I could unscrew the original cable and put in the coax I bought at Wal-Mart. After I put everything back together and wire-tied the replacement cable so it wouldn’t catch on anything, I powered up the dish again. No error! Yeah! Now, you may be wondering why I need Winegard to send a replacement cable if the one from Wal-Mart works. The answer is because that cable bends and flexes as the dish moves. It is also exposed to the elements. Apparently the Wal-Mart cables are indoor cables and will quickly crack and fail if used in that way. Apparently, this is a common problem. If you get one of these dishes, and you see the “no LNB voltage” error, this cable is almost always the cause. You may want to carry a short coax cable spare just in case. Since that cable is exposed to the elements 100% of the time, I’m not surprised the cables fail. In fact, I’m now thinking I should find some way to protect the other cables up there.